Throughout North America, the Timebenders have pleased clients that include Bill Gates, Francis Ford Coppola, United Airlines, The Boeing Group, University of Louisiana, the Royal Bank, Telus and countless others. They have performed at Caesar's Palace in Las Vegas, Hawaii, Florida, San Francisco and countless fairs and expositions all across North America. The Timebenders have truly earned the title of Canada’s best retro show band. Now in their 16th year on the North American music scene, their experience is evident in every performance. Their comic timing, sharp musical skills and zany choreography make it a perfect balance of total entertainment. Audience participation is a key ingredient in the Timebenders’ show. They are masters at getting the crowd excited and are often off the stage onto the dance floor or even have the audience up on the stage with them! 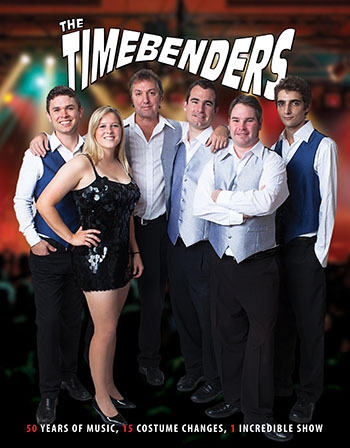 If a good laugh, some great music, dancing and a top-notch show is what your event calls for, the Timebenders Experience is the group for you. Noteable Entertainment & Events is a Vancouver based booking agency, party rental, entertainment services and event production company. If you are interested in booking The Timebenders please contact us.